We offer sanding and finishing of newly installed floors as well as sanding of existing floors, often referred to as “refinishing”. 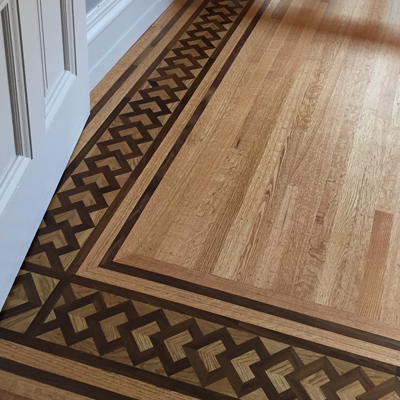 Depending on the species of wood and the look that you want to achieve, there are many techniques that can be used. 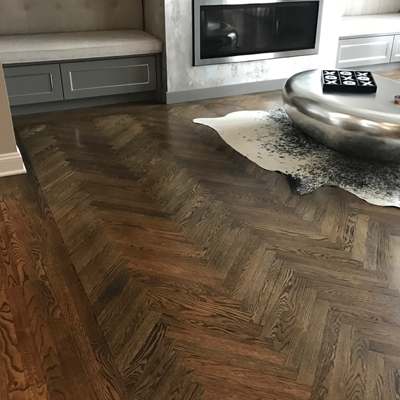 They can range from a natural finish which is a fairly straightforward process, to a stained, dyed or oiled floor, which involves a longer process with more steps, to wire brushed and hand scraped floors which are techniques for creating texture on a sanded floor. 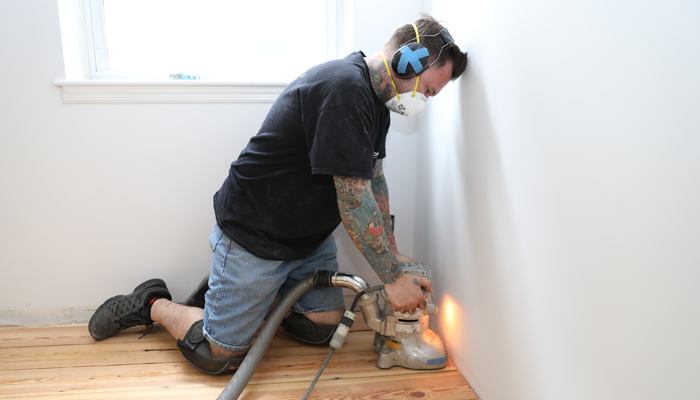 Sanding a hardwood floor involves removing as little material as possible to achieve a flat floor. Flatness is a relative term and you shouldn’t expect “piano top” flatness. 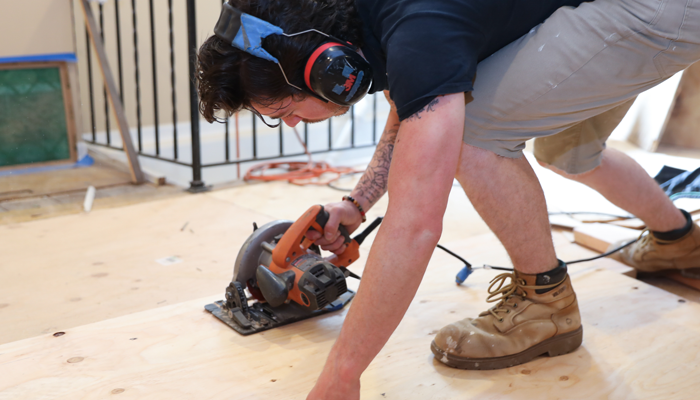 There are many steps and various sanding machines we use to get a floor flattened to or flatter than industry standard. 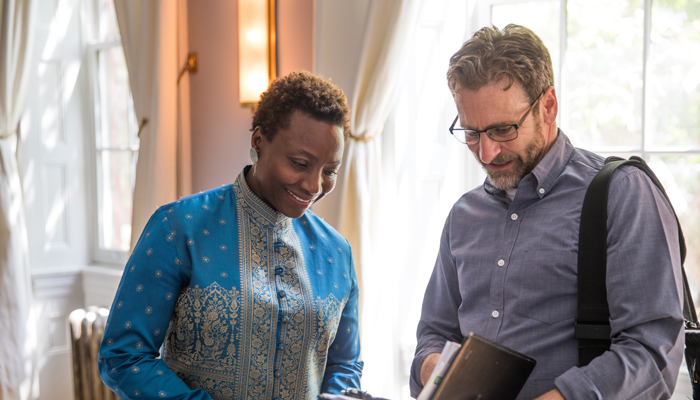 We use the best machines available and are always updating our arsenal of tools as well as incorporating new techniques. The first step in the sanding/finishing process is to decide what sort of end result you’d like to achieve. There are many options and looks available. We can discuss options and once a decision is reached, we can begin the sanding process. We use dust containment systems* but we also mask off areas where we won’t be working in order to keep those areas absolutely free of residual dust. The next step is to set up our sanding equipment. Our main sanders are 220 volt machines, which will require us to either plug into dryer/oven outlets or to wire into your electrical panel. The rest of our machines are 110 volt and can be plugged into your wall outlets. From there, we begin sanding. It will be LOUD! We generally start with the lightest grit sandpaper possible for your particular floor and move to lighter grits with each subsequent pass. Depending on the size of your project and the look you’re aiming for, this can take anywhere from 1 day to a few weeks. When we are finished sanding, the finishing process can begin. 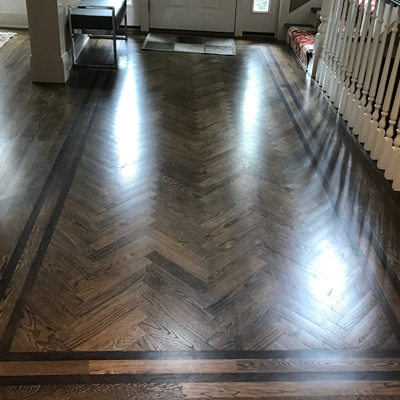 The finishing process’s vary from a polyurethane or a hardwax oil applied directly to the sanded wood, to staining and dying or oiling the floor to alter the color. If a color is desired, this would be the next step in the process. Dustless sanding systems are vacuums that are attached to our sanders to help to eliminate airborne dust particles created by the sanding process. We use systems manufactured by Oneida, Festool, American Sanders, and Pro Team. While containment systems don’t eliminate 100% of airborne dust, they are very effective and will help to keep your home clean and healthy. We also utilize dust containment systems made by ZipWall in order to keep dust from entering areas of your home where we aren’t working. There are quite a few ways of coloring your floors. 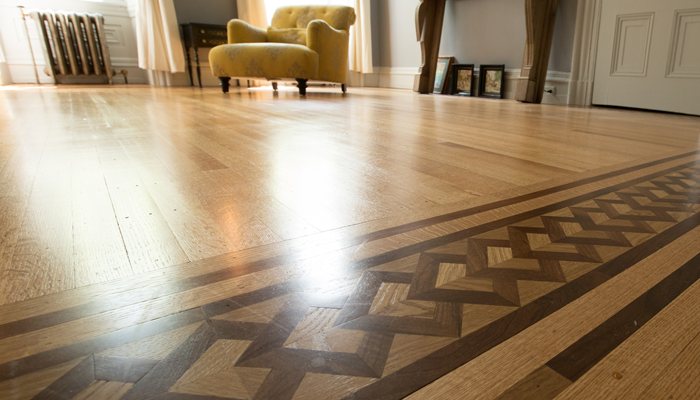 Each one will add time to the overall process of finishing your floor. The range of colors available “straight out of the can” is very wide. When you start mixing colors, the array is practically unlimited! Here is a listing of a few of the more common colorants along with a brief description of each. Stains: Stains are the most commonly used colorants. They are usually oil based, although they are also available in alcohol and water based formulations. The oil based stains are high in VOC’s* and have a strong odor which may take 1-2 days to dissipate. The pigment molecules are fairly large, which means that they don’t penetrate deeply into the wood fibers. They can range from a very light amber color (neutral) to very nearly black. After application, it can take up to 48 hours to be dry enough to apply a finish. We currently offer oil based stains made by Duraseal* and Bona* These stains are color fast which means that they will not normally fade with exposure to UV light. Pretones and Reactives: Pretones are another way of adding color to your floor. They are generally used as a precursor to achieving special effects such as cerusing. Rubio Monocoat, Loba and Bona all make pretone colorants. Iron Acetate is another pretoner that is made by soaking steel wool in white vinegar, straining it and applying it directly to the floor prior to staining. We make IA in our shop, although there are other reactive agents available from various manufacturers. 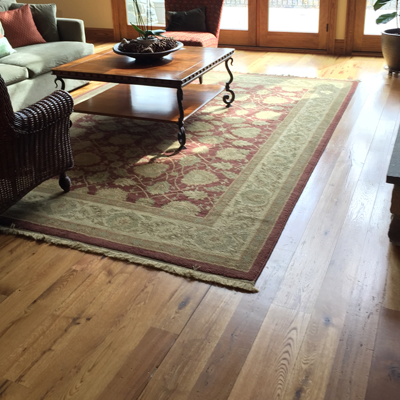 There are a number of finishes commonly used on hardwood floors. They vary in many ways. Here are some descriptions of each type of finish that we use. Oil Modified Polyurethane: Oil modified polyurethane (OMU) is typically referred to as “polyurethane”. It is a film forming finish, which means that a protective coating is left on the surface of the floor as it cures. It has a strong odor with fairly high VOC*’s. which generally dissipate after a few days. Each coat needs to dry overnight prior to applying the next coat and it tends to “amber” over time when exposed to UV light. Usually applied in 3 coats, it is a very durable, low maintenance finish. Full cure time can be as long as 30 days, but your floors will be walkable in 24 hours. We currently offer Oil Modified Polyurethane made by Polo Plaz* and Lenmar*. Waterborne Polyurethane: Waterborne polyurethanes are also film forming finishes, tend to be clear to light amber and are less prone to changing color over time. These finishes come in 2 versions. The first is a catalyzed 2 component finish (referred to as 2K) and the second is a non-catalyzed single component finish (referred to as 1K) . Both versions have fast dry times (often 2-3 hours per coat) and have a lower VOC * content than an OMU which means that they are more environmentally friendly and have less smell. Because they dry faster than an OMU, they are good options when there is a tight time frame to consider. Both 1K and 2K are durable although the 2K finishes are harder. We offer waterborne finishes made by Bona* Duraseal and Loba*. Penetrating Oils and Hard Wax Oils: Hardwax oils have been used in Europe for many years. They are generally low but not zero VOC with the exception of one product that we are aware of. 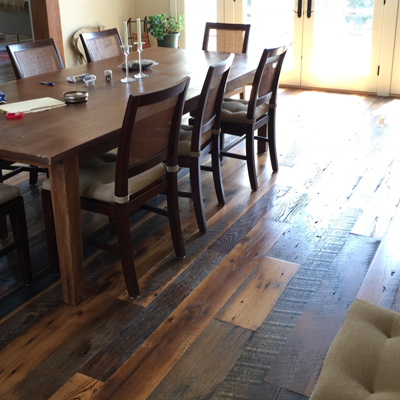 Hardwax oils do not leave a film finish on the surface of the wood. Rather, they penetrate into the wood itself and form a molecular bond with the cellulose in the wood. This results in a deep luster that brings out the natural beauty of the wood grain and protects the wood from the inside. You can almost see down into the grain of the wood. Hardwax oils are very durable if maintained properly. Most manufacturers require that their product be maintained with their proprietary cleaning products. Hardwax oils are also fairly easy to repair when damaged. We currently offer hardwax oils from Bona, Loba, Rubio Monocoat, Pallman and Odie’s Oil. 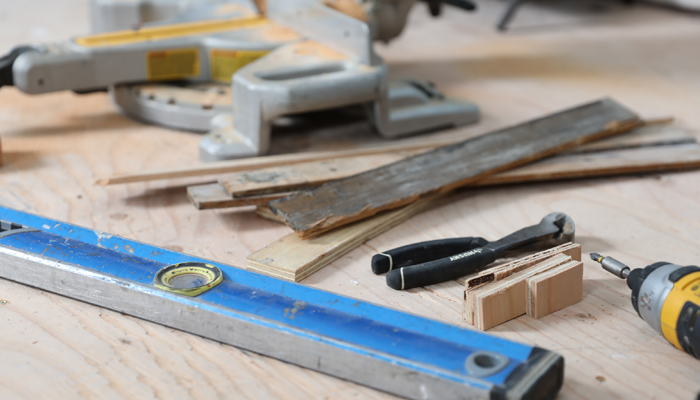 We utilize a wide variety of equipment while building and sanding your floors and are always updating our tool library! Sanding Equipment: Lagler, American Sanders, Festool, Galaxy, Bosch, and Dewalt.